Designing a kitchen for your clients can traditionally be a long and costly process but with a professional kitchen design program you can save time, money, and effort. Here, we’ll show you why our software, Polyboard, is the best of its kind and which of the latest kitchen cabinet design trends are an absolute breeze to create with it. The trends are how you attract new clients, but the professional designs and timely service are how you keep them on board. Polyboard is a parametric design tool that is much quicker and more reliable than drawing by hand or with a CAD programme. It allows you to create dream kitchens with ease. It is perfect for professional kitchen design because it is built for bar and panel-based furniture (like cabinets), which are commonly found in kitchens. 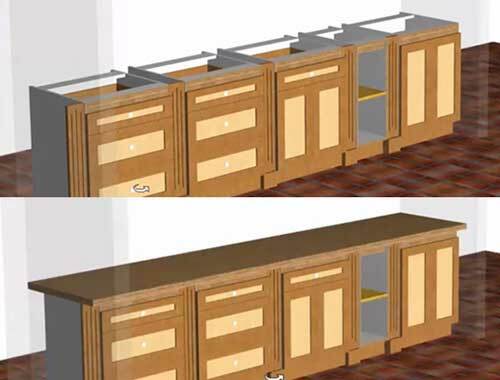 With Polyboard, you can do things like drag worktops across multiple cabinets and even leave a gap in the worktop for items like sinks, and oven hobs by just adding in top rails for the cabinets. Of course, you don’t have to design everything from scratch. Polyboard’s Quick Design libraries have a huge range of branded items that are ready-made for you to drag and drop into your design, from drawers to drawer sliders, hinges to panel fixings, and much more besides. Your client may even have their heart set on a certain brand of tiles or style of cabinet and they’ll appreciate your ability to accommodate them easily. Every single kitchen is different and, as such, off the shelf design elements may not fit in right. That’s not a problem for Polyboard though as all of our elements, including the branded ones, are completely customizable. All it takes is a few clicks of the mouse. Does one of the cabinets need to be a few millimetres narrower? No problem. We can resize. Is it the right design but the wrong colour? We can change that to fit your client’s colour scheme. Do the cabinets need to be lower in order to meet the needs of clients using wheelchairs? You guessed it, we can do it. Polyboard even has 2D and 3D presentations for your clients, so that they can easily envisage how the room will actually look, including their cookers, extractor fans and other room features. It can often be a real nightmare to keep track of all of your cut lists, plans, drilling placements, CNC output, and costings when designing kitchens, especially when your clients want you to make changes late in the game. Thankfully, Polyboard calculates all of these things automatically for you with every change you make. So, if your client wants a larger stove or fridge and you have to adjust the cabinets to fit, there’s no need to crack out the calculator and the coffee for a long night of recalculations. 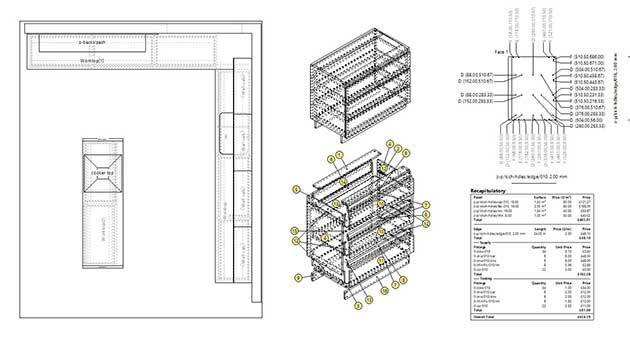 Our professional kitchen design program is unique, in that it is so much more than just a design tool. It allows you to automatically output your cut list, plans and costs to run your CNC machine, once your design is finished. Polyboard also integrates effortlessly with our OptiCut and OptiNest software, which respectively optimizes your cutting list and nests the cut pieces together to minimize waste of materials (which saves you money). We understand that many woodworking professionals have had problems getting their design software and their CNC machines to work together – no matter how great each system’s support service is – which is why we decided to offer a unique solution. We’ve partnered with a great CNC supplier in order to create turn key software and CNC machine configurations, especially for the woodwork industry, in order to save you time (which we know equals money) and effort. Less time on the phone to customer support or trawling through online forums looking for help and more time spent designing and creating kitchens. You won’t find that kind of service anywhere else. With any software, there is going to be things you need help with; from needing to know where your past design got saved to wondering how to implement a design trend that you’ve seen. That’s why we offer a wide variety of support options from online training sessions to an on-site instruction upon delivery and set up of your CNC machine to a technical support forum to 1-2-1 TeamViewer sessions. There are also hundreds of videos, models, and guides available on our site to help you through any problem. Whatever your query, we’re confident that our team can help. We’re cheaper: Yes, that’s right. 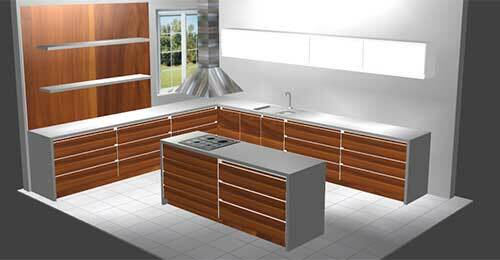 You get all the great benefits of a professional kitchen design program at a fraction of the cost of our competitors. No pushy salespeople: The price of absolutely everything that we offer is displayed clearly on our website. We don’t believe in having you call a number to speak to a sales representative who will trick you into buying stuff you don’t need. No hidden costs: We’ve all had the experience of thinking something is a great deal, until all the extras start piling up. We also know our software is a great deal: that’s why we never hide any costs from you. If you’re still not convinced that Polyboard is the right kitchen design software for you, then consider trying our free version because we’re sure that you’ll change your mind. As with any design-based business, it’s important to stay on top of the latest trends, in order to give your clients a room they’ll love, so we’ve sourced the cabinet design trends that architects, builders, and designers are loving right now. As part of the ongoing vintage chic trend in home design, oak is making a big comeback in kitchen cabinets. It’s also an incredibly versatile wood that fits in well with any design, from traditional to industrial to modern, and can even be painted to suit the colour scheme. Chefs (professional or otherwise) are always making bold choices with their cooking, so why shouldn’t their kitchen reflect that? Vibrant jewel tones, carefully balanced with neutrals like beige and cream, are all the rage. More people than ever are seeking clean aesthetics and minimalism in their kitchen design, which means leaving behind ornate features found in traditional cupboard doors. Not only are they on-trend but they’re so much easier to clean. With minimalism and vintage chic ruling the roost, many people are choosing to combine the two in order to truly leave their mark. This might mean mixing painted wood with natural or using different colours for the island and other cabinets or using modern sleek designs in retro colours. Many people would benefit from direct lighting on their worktops in order to see what they are doing when they’re working. Thus, under cabinet lighting. Your clients will never be left chopping vegetables in a dark corner ever again. Polyboard can handle all of these new cabinet design trends, meaning you stay ahead of the competition, while making your job so much simpler. Why not try our kitchen design program today?